Everyone needs a river. Everyone is a river. I think about that river often -– the river of my childhood. I have returned to it many times since my youth but only in my mind. Its beauty lingers still, ever fixed in my memory, to help me through the everyday busyness and rush of adulthood or during meditation or creative pursuits. From the side of the dusty Hollow Road, it never looked like much of a river. It was narrow. I could wade across it in about twenty-five steps. It was shallow. Or, so it seemed. But if one placed a foot a few degrees to the right of the majestic rock formation, the raging falls could bury an unknowing swimmer faster than he or she could skip a stone across it. Yes, the Mettowee River knew its power. The strength of the hearty snow-capped Vermont mountains allowed hundreds of years of gritty New England resolve to plummet and cascade into the nearby town of Dorset in the southwest portion of the state. Its icy exactness sliced the gloating town into halves with its forceful purpose. On the one side was Dorset Hollow Road where wealthy oil tycoons would spend a month or two each summer in lonely vacation homes placed upon white birch farms fresh out of Robert Frost. Their slick Arabian horse stables and in-ground heated pools seemed to have been plunked down in what were once pioneer cow pastures. The faint tinkles of cowbells could still be heard in the rush of a June morning breeze. Outstretched on the other side of the river was Kirby Hollow Road where humans actually lived like cattle in weary barns with paint that had dulled with the harsh winters. Folks made themselves at home in trailers with worn tires stacked out front like welcome signs and where mud-encrusted half breed dogs in chains yapped at gutted-out deer carcasses hanging from trees. Run down shelters looked as if they could be blown over in a gentle wind, sheep looked at home in the front yards, and dirty-footed children grew up with little more than dreams. The river seemed to know my family was neither rich nor poor, but that we were needy, in many other ways. 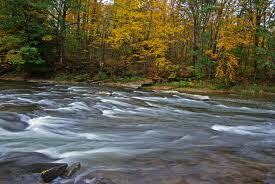 The river beckoned us, my brothers and me, to its intoxicating lures, its mystical comfort, and its raging beauty. We escaped to that place. We were children, then, and so easy to entice. The river was the summer swimming hole where the locals might congregate to cool; it was the place to rest and dip one’s tired toes after a hike in the woods. As children, my brothers and I spent many hours there. I could disappear at the river’s edge. And I did. I blended in with the land as I wrapped myself up in the shady protection of its cocoon-like refuge. Pine needles cushioned my feet and let me slip into the tranquil beauty of it all without disturbing a nearby deer or chipmunk. The smell of the damp, newly sprung earth made me feel even closer to the nature enveloping itself around me while thick, towering evergreens stood guard overhead. I heard the gush of the currents rage loudly – loud enough to mute the growing self-doubts of prepubescence and, eventually, the rebellious teenage angst that began to form while growing up by the river’s wild side. That river was cold. Stubbornly cold. It refused to ever freeze, even under winter’s death-like grip. The water would chill my brothers and me instantly, numbing us from the pain of who we were and from who we weren’t. The ice cold would shock us, would make us feel alive. We’d let that river, those rapid currents, hurl us, whirl us, carry us away just to see what might happen. We would feel light again in that water – no more of the crushing weights and burdens of growing up. Would the river take us far, far away from where we were? We never seemed to care that it might or that it could. Even today, I can still feel the warmth of the autumn sun in the field on the other side of the river. After swimming across to the embankment, I could fall into its safety as the tall golden grasses would shield me, meld me to the earth again, yet still allow the rays of a brighter tomorrow to offer themselves up. I wonder now how I could have ever been so foolish to have wanted to leave that town, to leave that time. Always wanting to go, to grow, to leave that little place of security, always feeling that I had now become too old for it, too wise for it, too strong for it. But, no one could expect me to be as old or as smart as the land. I now know that the river flowed from something bigger than itself and then out again to the world, touching other lives – healing them, inspiring them. This made the Mettowee River that much more regal, that much more inviting, and warmly maternal. That river has nursed me through many episodes when life has smashed me. Like my bone-chilled body lifting itself from that river of childhood, I have lifted myself many times after that and many times yet to come from that river of the mind. Now, a mother myself, I wish to share the river with my daughter. She will experience great devastation of nature and the environment in her lifetime. I only hope she will be able to experience the river as I did, in all its still unchanged glory, even if only for this brief time. She will have other reasons to look to the river, too. For peace. As a refuge from many things yet to be determined. For strength. My daughter and I step to the river’s edge. As I look at her now, hopeful and pure, I realize my daughter is a product of that river. Without the river’s power to have kept me strong and alive in all the ways it has, my daughter would not be here now. Gently, we wade in. Mother and child. The river surrounds us, tries to whisk us off. But, I refuse this time – to let that river carry us away. My daughter and I stand strong. While the flowing currents swish around us, I look into my daughter’s eyes and hope. Let these years stand still now.